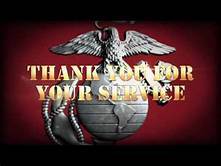 243rd Marine Corps Anniversary – Fix Bayonets! I never tire of watching, reading or hearing about the bravery of this branch of the service. A few Good Men Indeed! I just got through another review of the “Pacific” series where Marines were pounding and dying on island after island to provide havens and airfields for our air corp to finally be able to reach Japan. Then the AFC channel has the Korean war and what these guys were called on to do there. Marines have never had a picnic when it came to battle…they were some fierce gutsy men to have done the Pacific for 4 years and then Korea. McArthur was right, we should have vaporized China then. Just as Patton was right about the Russians after Germany’s defeat. “Some people spend an entire lifetime wondering if they made a difference in the world. But, the Marines don’t have that problem.” – Ronald Reagan. Wonderful quote.